Going the distance around the flat bits of the South West. And cake. Long Audax rides, I've discovered, are pretty much everything I like about riding on the road. There's cake, for a start. Lots of cake. And there's the camaraderie of a mass start and a big group ride, and plenty of easy miles sitting in a bunch and chatting. Until you stop for cake. And there's a maximum speed as well as a minimum one, which makes me feel like I'm doing everyone a favour by not going too quickly. 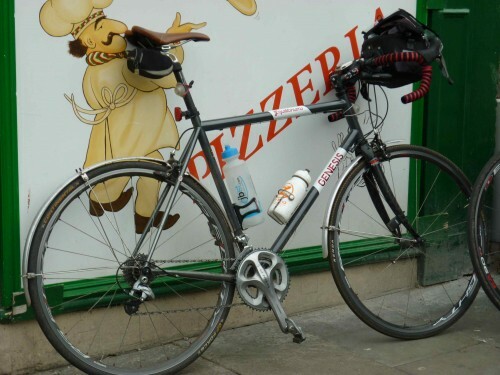 But it's a solitary pursuit too: however many of you there are at the start – and with an Audax it's never going to be the thousands that a big sportive attracts – by the time you're deep into the ride the field has inevitably thinned to you. And a few others, if you've managed to stay together. It becomes more contemplative, the talking becomes secondary to the riding and you become very aware of the relationship between you and your bike, the limits of your fitness that day. I've heard people talk about how signposted rides free you up to enjoy the scenery more but for me the opposite is true. A route sheet means that you not only enjoy the scenery but understand it: you need to know where you're going, and how to get back on track if you miss a turn. You're much more in tune with your surroundings and it adds to the experience. I'd never done a 200km ride before, of any description. My previous mark was the 116-mile Red Ride (remember them, the PruTour etape?) from Rochester to Bournemouth, an altogether different day out than the LVIS-organised Barry's Bristol Ball Buster, a 214km meandering route that stretched from the Severn Estuary to the Somerset levels. Turning up for the 8am start is was refreshing to see the usual mix of people and machinery. For every Carbon road iron there was at least two steel machines of varying ages, some fixed, some geared. A tandem too, and Bristol Triathlon club on some nice looking race kit. I was riding my newly-minted Genesis Equilibrium, which is a traditional Audax bike in all but name and paintjob, which nicely complemented riding partner Jon's Felt AR-4, with Oval TT extensions and feathery KCNC compact chainset. Whatever gets you round. 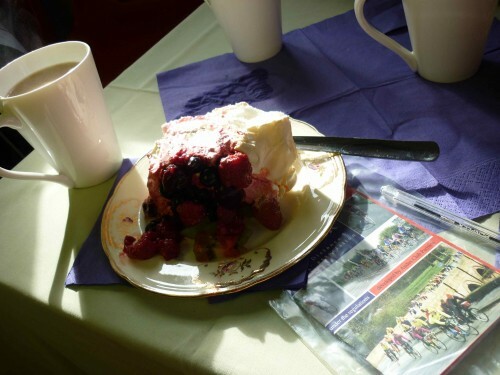 That's what I miss at sportives, the feeling that it's the full cycling pie, not just a slice. That and the £6 entry fee. The early signs were inauspicious. Jon, having completed a 20-mile run over the Brecon Becons the day before, was complaining of sore legs just on the ride to the start. I lost my bar bag to a speed hump going through Ashton Court estate and had to jam a twig into the quick release to keep it from escaping again. We kept getting held up at roadworks and it was all uphill, or seemed like it. However, the climbing through Bristol deposited us north of the M5 on the lanes along the Severn Estuary, in a fairly big and chatty group with the wind at our backs, and soon we were crossing off the miles at a decent pace. The first stop at 50km came almost too quickly but you'd need a will stronger than mine to resist the lure of Women's Institute pavlova and a mug of sugary tea. Suitably refreshed we set off again, turning back into the wind for what promised to be a long leg towards the Mendips. Jon wasn't of a mind to lengthen it more than necessary though, and hared off through his local lanes with me sucking his wheel; soon we were on our own as the outskirts of Bristol and Keynsham flew past and the conversation turned to concentration. We picked up Ian, another 200ker, near Chew Magna and he stayed with us across the valley floor as we took it in turns to face down the wind. By the time we reached the big climb of the day there were 100km in the legs and the chosen route up to the Mendip plateau was, well, direct, a steep, winding lane past inviting pubs. Jon's exertions of the day before had left him okay on the flat but the hills were starting to tell, and when we regrouped at a tea stop at the top – which it turned out wasn't serving us tea at all, but another audax – Ian was gone. We caught up with him again at an info checkpoint but lost him on the next climb before we tackled the narrow, skittish descent to Wookey Hole. Across the levels there was some respite from the climbing but with a sting in the tail, a short, fierce climb round the back of Glastonbury Tor that was the main topic of conversation at the tea stop in the High Street. That, and the quality of the bacon butties and hot chocolate on offer. It was about this point, 150km in, that I realised for the first time that the new, slightly slimmer me was turning out to be a pretty capable mile eater. This was the first big ride of the year and it was already longer than anything I'd attempted last year, but there was plenty left in the legs. Okay I'm still not quick – the first rider, Gary on his fixed, had been and gone an hour and a half ago – but then I don't think I ever will be. Maybe my mission should be going the distance. I only have to get there before they shut the checkpoints. From Glastonbury we set out as a foursome, having picked up Ian who arrived with a bemused look on his face from completely the wrong direction, and a chap from Hereford whose name I've forgotten (sorry!). 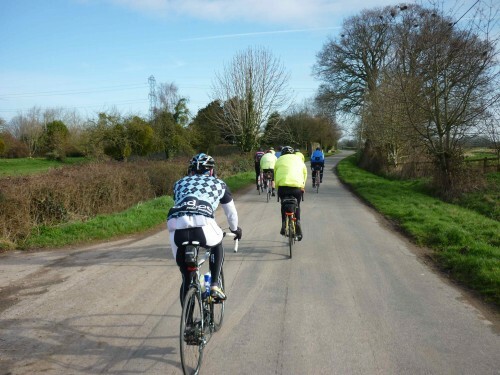 The road from Glastonbury to Wedmore is almost unnaturally flat along most of its length, and we set up an impromptu pace line that had us eating up the miles before a few stiff climbs snapped the elastic holding on our fourth member, and we were reduced to three again. The route which had mostly been long, steady climbs and flat sections was now suddenly all short, sharp hills and it was taking its toll on tired legs until the welcome sight of Yatton and the roads over the levels that I know well from the Exmouth Exodus. They're also home to Clevedon CC's evening 10 time trial, and Jon suddenly had his race head on again, winding up the pace as we zipped across the flats. After the last checkpoint there was just 20km to go and I spent a lot of it thinking back over the ride. A lot of the time my thoughts turned to my new bike, a Genesis Equilibrium frame built up with most of the kit off my road bike when I realised that a full-on road bike wasn't really what I wanted, or needed. I'd tried the Genesis before, and obviously we've reviewed it too, but I wasn't expecting it to be this good, this comfy, this capable. This is a frame that costs just £230 but I can't imagine how any bike would have handled the miles better. Fit a quiet freehub and listen to the lovely steel thrum that you get from the tarmac. Stamp on the pedals and feel the liveliness, the spring in the tail. Point it downhill and it tracks beautifully, giving you confidence. We've only been on one day out together but we're firm friends. A few shouts to the other kit too. Ultegra 6700 once again proved that it's pretty much unflappable, I can count the graunchy shifts in 214km of riding on the fingers of one hand. Charge's Spoon saddle is a thing of wonder: so cheap, so comfy. There were more Spoons on 200km bikes than any other type of saddle; even, I think, Brooks. The last challenge was a long, winding climb from Portbury to the top of the ridge which pushed us over 2,000m for the day and I almost – almost – enjoyed. By the time we dropped down the other side to Long Ashton and a fine spread of cakes, I was both elated and sad it was over, I was feeling strong at the finish. Could I have managed 300km? I won't ever know, but I can always have a bash later in the year, and I'm tempted. Mr Pickwick's Tour of the Cotswolds in July looks like it might be the one - anyone else coming? Massive thanks to everyone at LVIS, you did a fine job of organising your first Audax and I'll be back next year, when no doubt it'll be a howling, rain-lashed March day and I'll hate every minute. Here's till then. Great article Dave and well done on the 200k. Having never quite seen the point of audaxes (mainly because my map-reading skills are shockingly, embarrassingly bad), I'm now quite tempted. The 3D 300 is organised by Peter Loakes, and is thought of as one of the more difficult 300s. I haven't done it but there is a style of audax from people based in Dorset that assumes routes must include many steep gravel strewn lanes. The Peacocks and Kites, again I haven't done it- but it is pencilled in to my schedule for this year. It goes to the beautiful Elan Valley starting from Cardiff. It has a good rep as an easier ride. sheesh. one thing at a time! you going?